Just concluding its second season on the SyFy Channel, Haven has developed a strong and loyal group of fans who are transfixed each Friday to their TVs. Some are former X-Files fans who have been hopping around from show to show and finally feel they have something that is rockin' their paranormal socks off like Mulder and Scully did in the 1990s. While Haven is no X-Files, I proudly claim myself a fan. I've heard I might be missing out on Fringe or Eureka, but Haven is the odd, creepy, and humorous show that grabbed me from the start. Audrey Parker is an FBI agent with a questionable past who arrives in Haven, a small town in New England, on a random case and comes across a photograph from twenty or thirty years before featuring an unnamed woman who looks a lot like her. Obviously it's the mother she's never known and Audrey decides to remain in town to uncover this mystery. She soon learns that the town has its own secret with "The Troubles," which are paranormal events that crop up every few years, tormenting those who are afflicted. With Nathan, the town cop, to Duke the shady criminal slowly getting away from his own past, and Vince and Dave, two crotchety old curmudgeons that seem to have a little bit of insight into everything, the town's "troubles" slowly come to light and become the very "thing" they have to battle. While other people may be affected by The Troubles, Audrey is the only one who isn't and it's this immunity that helps to fight and/or cure those who are afflicted. The show is loosely based on Stephen King's short story, The Colorado Kid. And after finishing the story last night, loosely based is exactly how to describe its association with the TV show. In fact, I have no idea how that book led to the TV show at all. I'm glad it did, but I am scratching my head and still wondering how it all came about. With The Colorado Kid, Stephen King's novella takes place in Moose Lookit Island off the coast of Maine. Steffi, a young intern who is spending the summer working at the town newspaper (run by Vince and Dave, who are the only two characters in the story that are on the show), is having lunch with them at The Grey Gull (okay, that's also in the show) along with a reporter from the Boston Globe. The Globe reporter is trying to get a series of feature stories to run in anticipation of the spooky Halloween season and is disappointed that the stories he hears from Vince and Dave are ones he's already heard before. But it's when he leaves that Steffi probes more with the two old guys and finally gets them to tell her a story that has, twenty-five years later, still haunted them. A mystery it is, but a full story, it isn't. A dead guy on a beach, a Russian coin, and a pack of smokes is all that's on him. He's a John Doe for sixteen months before he gets identified but no one understands why this guy from Colorado is found dead in Maine. No business or personal reason brought him out there, nor do any financial transactions show how he got there. He's just dead on a beach and that's all there is to it. However, let's face it, Stephen King is usually a pretty good storyteller and through the voices of Vince and Dave, he doesn't really fail on this one. I write really because some will definitely argue that there isn't a story with this one, and they might be right. If you're looking for that literary bow to tie this one all up and give you that a-ha moment, it's not going to happen. It's, as King writes it in his afterword, more about the fact that all of us enjoy a good mystery in life, whether we end up finding the answer or not. And isn't that true? No one really knows if UFOs are either piloted by little green men or if the military is having a good ole chuckle every time they test new spacecraft, but either way, we thrive off these "what ifs." We like to toss our theories around and see what feels right. That's what The Colorado Kid does. It's a simple reminder that sometimes we just like to be told a good story, even if the ending is whatever we make it out to be. But if you're a Haven fan looking to see how the TV show came about, forget it. Save for two characters, a bar, and a closed off town to outsiders, there's really nothing to tie one to the other. I've not watched that show on TV (I stay away from TV in general) but am a big fan of Uncle Stevie. If you have read some of his other short stories, you know that he doesn't always have alot going on. He relies more on his quirky characters and nuances. I give him slack for this because of who he is I suppose! Oh right on. I was wondering how closely it was based. Thank you so much for the breakdown. Mr. Whimsy and I adore Haven. Wasn't that finale AWESOME? Do you think you-know-who shot you-know-who? 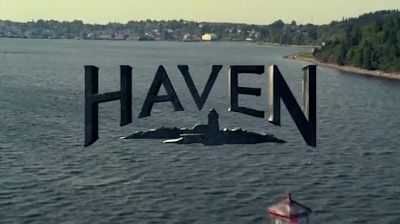 I have never seen Haven, but it sounds like it might be something worth checking out. I like that you gave a rundown of both the series and the book that inspired it, and shared your opinions on both. I am not sure that I would read the book, but I would definitely watch the show and am going to add it to my Netflix queue right now! Thanks for a great double review, Natalie! Juju - Love the show, too! I'm thinking he did but that you-know-who might be okay from it with his most recently understood (or acquired) powers? Zibilee - Let me know what you think of the show, Heather! It's not for everyone, but I am a fan of these sorts of shows, and not often do I come across one that has the right blend of the oddity, the paranormal, and most especially, the humor. This one, in my honest opinion, does have the right mix. It's great to know about this. I think I need to watch Haven! Thank you thank you thank you! Like I mentioned yesterday I have been trying to get a copy of this old book from paperback swap so I could really find out the story behind the story....should have known it would be so very loosely based. Im not a big fan of short stories so I will probably cross this one of the list. And be happy watching Haven. Great and tremendously helpful review! Oh, good to know. I haven't read Steven King in ages but I love Haven and was thinking about reading the book. I'm still going to but now I know. Thanks. So, my wife, who is a devoted SK fan, says she read that the option for The Colorado Kid was about to expire, so it HAD to be turned into something, and hence, Haven came about. She's boycotting the show since it has zero connection to TCK. Kailana - Oh, that would be so fun to visit the sites when they're filming it. I totally would go. If you go, send me a pic! Martha @ Hey, I want to read that - Let me know what you think if you read it! Audra - Wha?! No, no boycotting! :) It definitely has nothing to do with the story so that's cool trivia info to have that the option was going to expire so they turned it into something. If she ever decides to watch it, I would love her (and your!) thoughts on it! Natalie -- I'll see if my OnDemand has some eps to try to lure her in with! Also, if you're an audiobook person, there's a great actor from the tv version of Storm of the Century who reads it -- he has a GREAT Maine accent that is spot on! Audra - I love audiobooks, I will definitely check it out! I love a good New England accent!! It does sound like it has only the loosest of connections. I am a big King fan. I don't think he gets the credit he is due as a writer. He is a masterful storyteller!